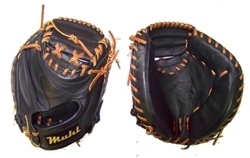 This is the Muhl Tech 33.5" Pro-Elite Series Catcher's Mitt. Muhl Tech Pro-Elite Series gloves are made from a premium grade leather. They include full leather exterior and lining. Although gloves may be stiff at first, they will break in quite nicely and become a durable and long-lasting part of your baseball equipment. They are made to withstand the tests of time. The Pro-Elite Series gloves include thicker supports in the thumb and pinky, which allow the glove to retain its shape. Finger padding is 100% wool.